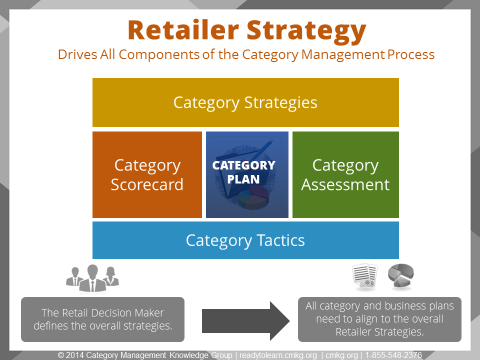 Who really owns Category Management? When working with clients and students, I often ask them, “who owns the catman process?” About 50% respond “both Retailer and Vendor”, 30% respond “the Vendor” and 20% think it’s the Retailer. It is actually the Retailer who owns the process – Vendors play a role in the process to provide data and resources as category experts but they don’t own the process. Retailers each have their own unique approach to catman based on their internal strategies, guidelines and processes and Vendors work with them to develop strategic category plans and improve the Shopper experience. The problem for some Retailers is that they don’t have well-articulated strategies, they have gaps in their strategies and/or they aren't effectively communicating their strategies. And there are many Vendors who continue to create brand-focused solutions that focus on their consumer (and not the Retailer's Shopper). This creates an issue in the category management foundations. Vendors (including multi-functional teams) can improve their understanding and focus on understanding and creating category solutions for each unique Retailer and their Shoppers. So what’s included in a Retailer’s strategy? Assign roles to their categories, which help to establish the tactics at a more defined level based on importance of the category to the target Shopper. Of note, it’s not the Vendors who decide the role that the category plays for their Retailers – it’s based on the Retailers and the importance of that category to their Shoppers. These foundations are different for each Retailer and are what make them unique in the marketplace. Retailers with well-defined strategies and their associated guidelines and process arm their organization with the ability to make category decisions that align to the overall Shopper experience they are trying to achieve. These strategies should also be shared with Vendor partners who collaboratively work with them to develop category solutions that focus on meeting Shopper needs. Vendors need to ensure that they seek to understand their Retailer partner’s strategies and bring in category solutions that align to their strategies. If you’d like more information on Retailer Strategy, we have a certified category management training course that's a great starting point. If you are looking for who is the best category management training company for you, the free course preview below will give you an idea of what we have to offer.